MONTREAL : Canadian Waste & Recycling Expo (CWRE), Canada’s only trade event serving the waste, recycling and public works markets is already more than 50% sold out with seven months still left before the show opening. The 16th edition will be held in Montreal, Quebec, November 20 – 21, 2013, for the second time in the show’s history. With the increase of new companies participating in the trade show, CWRE continues to solidify its position as a critical component in the waste management marketplace. This list includes Nuera Industriel Inc., market leader in the conveyor industry; and LSC Environmental Products, leader in Alternative Daily Cover (ADC) and Passive Solar Ignited Gas Vent Flares. We also welcome first time exhibitor, Zirco Ltd., specializing in emission control products. Based in Seattle, Washington, Zonar Systems has also signed up to participate as an exhibitor. Zonar offers electronic fleet management products and services to our industry. With everything from storage systems and transportation to recycling, public works, construction/demolition, landfill operations, composting services and waste treatment, Canadian Waste & Recycling Expo will cover the entire industry reaching an international audience of industry professionals from across Canada and beyond. In addition to broad range of products and services on display, the Ontario Waste Management Association (OWMA) will produce the Canadian Waste Sector Symposium with partners, Reseau Environnement and the Conseil Des Entreprises De Services Environnementaux (CESE). 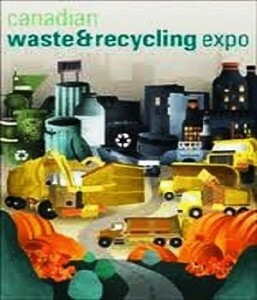 This program will host a number of educational discussions along with the waste sector facility tours. Other networking opportunities will also be held throughout the event including the Compost Council of Canada luncheon featuring expert speakers on the subject of organics recycling and compost.